NOTICE: Due to performance concerns, Aspyr does not recommend purchasing or playing Call of Duty : Black Ops on any Mac that has an Nvidia Graphics Chipset. Nvidia is currently working on providing an graphics driver update that will provide official support for the latest Mac Book Pro with the Nvidia 650M Graphics Card. The following chipsets are not supported for Call of Duty Black Ops Mac: HD30… 00, HD4000HD4670, HD6630M, Nvidia 8000 &9000 series, GT100 series, 320M, 330M, Intel Integrated GMA950, x3100.NOTICE: Activation key must be used on a valid Steam account. Requires internet connection.ABOUT THE GAMEThere is a soldier in all of us.Call of Duty®: Black Ops takes players to conflicts across the globe as elite Black Ops forces fight in the deniable operations and secret wars that occurred under the veil of the Cold War. Featuring an epic single-player campaign, an incredibly deep multiplayer experience and expanded co-op gameplay, Call of Duty: Black Ops runs on the improved World at War engine and offers amazing enhanced graphics, streaming texture technology, and superior lighting effects. KEY FEATURES Bonus! The included First Strike DLC gives you 5 incredibly diverse maps spanning the globe, including 4 new multiplayer maps and a chilling new Zombie experience, all at no extra charge! The hallmark intensity of Call of Duty returns with an impressive single-player campaign that takes players deep behind enemy lines as an elite Black Ops soldier engaging in covert warfare, classified operations, and explosive conflicts across the globe. ZOMBIES! For the first time on the Mac, fight to survive in one of the most thrilling and critically acclaimed co-op experiences in gaming. Expanding on the series' ultimate multiplayer experience, Call of Duty: Black Ops takes competitive play to new heights. Expect the fast-paced, action-packed combat you love with more features than ever before. SYSTEM REQUIREMENTS Minimum: Operating System: 10.7.4 (Lion), 10.8 (Mountain Lion) CPU Processor: Intel Core 2 Duo (Dual-Core) CPU Speed: 2.4 GHz Memory: 4 GB RAM Hard Disk Space: 15 GB Video Card (ATI): Radeon HD 3870 Video Card (NVidia): Geforce 650M Video Memory (VRam): 512 MB Peripherals: Macintosh mouse and keyboardSupported Video Cards: NVIDIA GeForce® 650M ATI Radeon HD 3870, HD 4670, HD 4850, HD 5670, HD 5750, HD 5770, HD 5870, HD 6490, HD 6750Recommended: CPU Processor: Intel Quad Core CPU Speed: 2.6 GHz Memory: 4 GB RAM Video Memory (VRam): 1GB*Apple original CPU's only, CPU upgrades not supported. Gamepad Support: Call of Duty: Black Ops supports the Xbox 360 wired gamepad only. NOTICE: We do not recommend that you play Call of Duty: Black Ops on any of the following unsupported graphic chipsets: HD3000 (2011 Mac Mini, 2011 MacBook Air, 2011 13” MacBook Pro) HD4000 (2012 13” MacBook Pro)ATI Radeon HD 2000 series, HD 4670, HD6630M NVIDIA 8000 & 9000 series, GT100 series, 320M, 330M Intel Integrated GMA950, x3100NOTICE: Internet connection required for Multiplayer and Zombies.NOTICE: Apple Intel Chipsets only. 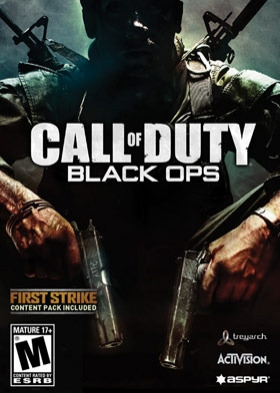 Power PC Processors (G4 and G5) are not supported.NOTICE: This game is not supported on volumes formatted as Mac OS Extended (Case Sensitive © 2010-2012 Activision Publishing, Inc. ACTIVISION, CALL OF DUTY and CALL OF DUTY BLACK OPS are trademarks of Activision Publishing, Inc. The ratings icon is a registered trademark of the Entertainment Software Association. This product contains software technology licensed from Id Software (”Id Technology”). Id Technology ©1999-2012 Id Software, Inc. Published and distributed by Aspyr Media, Inc. “Aspyr” and the Aspyr “star” logo are federally registered trademarks of Aspyr Media, Inc. Aspyr makes no guarantees regarding the availability of online play, and may modify or discontinue online service in its discretion without notice, including for example, ceasing online service for economic reasons due to a limited number of players continuing to make use of the service over time. Mac and the Mac logo are trademarks of Apple Computer, Inc., registered in the U.S. and other countries. The ratings icon is a trademark of theEntertainment Software Association. All other marks and trademarks are the property of their respective owners. All rights reserved.